There is a lot of activity at the house just now because we have had various teams carrying out surveys. Ecology, topographical and geophysical surveys – basically attempting to map and document everything living on, above and in the ground; to record the exact lay-out of the surrounding land with tree positions and surveying everything and anything that may be hidden under the top-soil. All this information will be gathered together and plotted to create an in-depth plan of the whole gardens and woodlands. This is essential to help guide the decision making for future plans and it means that at last the plans are beginning to materialise to save and restore this beautiful corner of Stirlingshire. I was working among some raspberry canes last week – a warm, dry day and was surprised to see two or three butterflies fluttering about, two ‘Peacocks’ and a ‘Comma’. These butterflies are some of the earliest ones to begin flying in Spring as, unbelievably, they actually hibernate in cool dry buildings throughout the winter. ‘Peacocks’ look quite black in flight as the underside of their wings are very dark, but they are easily recognised by the large colourful spots like ‘eyes’ on the upper surface of their wings. When hibernating, they hold their wings together and remain motionless, resembling a dry leaf but if threatened, they quickly open their wings flashing these purple eye-spots and can even hiss to deter small birds and mice who might otherwise eat them. Surely a successful strategy as I think I would be pretty disturbed if I realised a butterfly was hissing at me! ‘Comma’ butterflies are instantly recognisable owing to their ragged-edged wings and bright, coppery-orange colour. If you are lucky, you’ll be able to see the tell-tale, tiny, white ‘comma’ shaped mark on the underside of each of their wings. The next ones to look out for are the bright yellow ‘Brimstone’ and the fast-flying ‘Orange-Tips’. These will all become more abundant as the thorny hedgerows waken up and begin to flower and the weather warms up. If you can, leave a small patch of nettles somewhere in the garden so there is food for their caterpillars to eat. You can look up butterfly identification guidelines hereand it is always interesting to try and keep a note of which butterflies you see and when. On Thursday, I was picking daffodils for identification which requires me to send off unopened buds to experts who live in the north west of Scotland. I realised, when checking against last year’s photos that they have flowered 36 days earlier this year. That is quite an amazing statistic. And, of course, Easter 2019 is much later, (20 days) so there is every chance that we shall have very few, if any, daffodils blooming at Eastertide this Spring. There may some fruit blossom though as I noticed the old Victoria plum tree has begun to flower so it should still look pretty at the house. 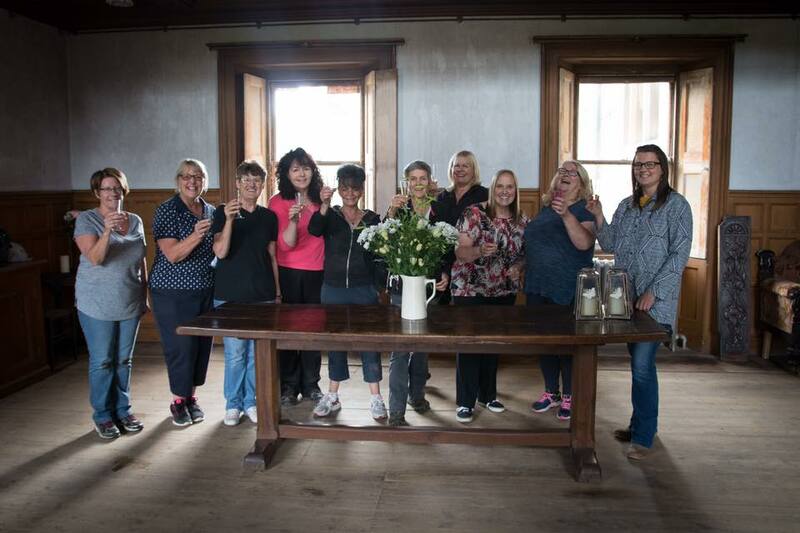 The daffodil experts, ‘Croft 16’ who are responsible for the upkeep of the National Collection of Pre-1930’s Daffodils have now identified about ten of our different Daffodils and Narcissus blooms. Technically, all daffodils are actually ‘Narcissus’whichis the Latin generic or family name and within that group there are daffodils, jonquils, paper-whites etc. Sometimes I think of daffodils as having mostly yellow colouring and narcissus as being mostly white, but it is not as simple as that. 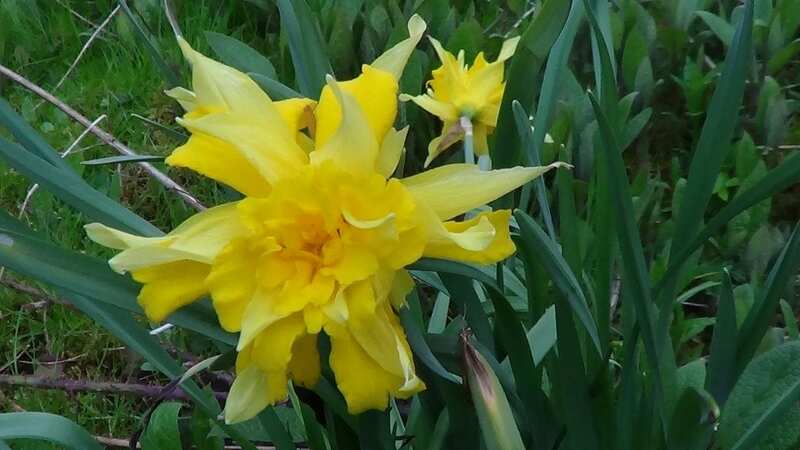 The daffodil family breaks up in 13 distinct groups or ‘Divisions’ which classify the flowers according various differences such as the shape and length of the petals and trumpet, the number of flowers on each stem and the overall shape of the flower. For example, the famous Wordsworth daffodil Narcissus pseudonarcissus is a Division 13 daffodil which places it in the group for natural forms and their varieties, whilst a Division 3 daffodil like ‘Seagull’ has been classified as ‘3’ because it has a small trumpet and Narcissus cyclamineusare classed as Division 6 because their petals fold backwards, exactly like a Cyclamen flower. I promise you, once you begin to notice details like this you will never look at daffodils the same way ever again! Two of our more unusual Daffodils have turned out to be called ‘Van Sion’ and ‘Albatross’, a double daffodil, which dates back to 1677 or even earlier and although we have no way of knowing if it was flowering here in the 17th Century, it does seem to be popping up all over the gardens so it has certainly been here for a long time. It is an explosion of petals and colour. ‘Albatross’ has been registered since 1891 and was created by the Rev. George Engleheart, a Victorian daffodil breeder, based in Suffolk, who created over 700 named daffodils during his lifetime (1851 – 1936). He received the Victoria medal from the RHS for services to Daffodil breeding in 1900. I think we may have about six of his creations and they all pre-date the 1890’s. Closer to home and a garden that you can visit is the Backhouse-Rossie Estatenear Cupar, in Fife. 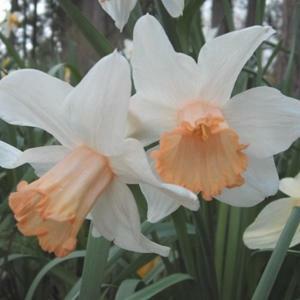 Several generations of the Backhouse family were breeders of the flower and created many beautiful daffodils including one with a pink trumpet as a homage to Robert’s wife, Sarah, also a daffodil breeder. ‘Mrs R.O. Backhouse’ is a stunning daffodil and instantly recognisable owing to its unique colours, you’re sure to recognise it anytime you see it. Daffodils are such an important flower in Springtime. They bring us much needed colour and a source of pollen and nectar for early foraging insects; they epitomise Easter and Mother’s Day; we see them planted en masse on roadside verges and occasionally stumble across them on a country walk but usually we only tend to see the ordinary yellow daffodil (if there is such a thing) with maybe the occasional darker trumpet or some tiny ‘Tete-a-Tete’ miniature blooms in a potted arrangement. Yet, there are literally thousands of different flowers out there just waiting for you to discover them. Pick a date on one of these warmer spring weekends and go and visit some of the amazing collections either locally or nationally. You won’t be disappointed. I seem to have got carried away a bit about daffodils, but I have to admit that the more I am finding out about them, the more they seem to be taking over my life. I warn you now, you follow up some of my suggestions at your peril and even more worryingly, next month we might be looking at Rhododendrons and that is subject that we could get completely lost in…. 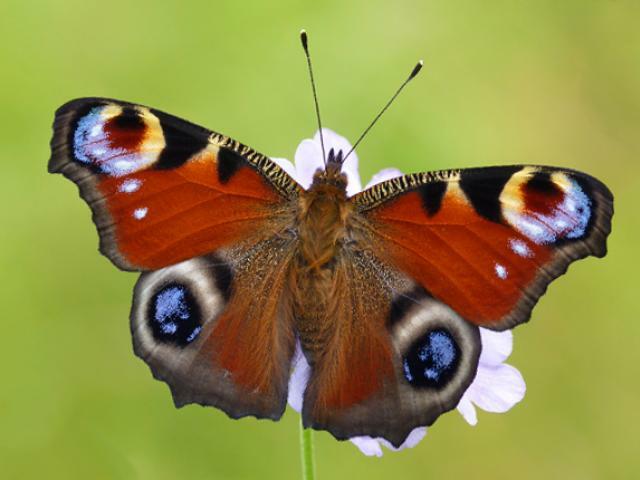 Featured image of the Peacock butterfly taken from here. Image of the Narcissus ‘Mrs R.O.Backhouse taken from here.